We like to consider the home to be a shelter from the outside world. However, most homes harbor a number of health concerns. There are many sources of harmful chemicals, irritants and contaminants, which could be lurking silently and invisibly in our home. Tiny particles of lead, asbestos, mold and even formaldehyde can be found in many residential buildings, unbeknownst to homeowners. According to research cited by Seventh Generation, these hazards can increase risk for infections, asthma, and even cancer. Take these steps to check the quality of your in-home air and to create a more healthful environment, providing cleaner, fresher air for you and your family members. Most of us think of home as a provider of creature comforts, but it also can be a source of indoor pollutants. Wood burning stoves and appliances, household cleaners, personal care items, and even your building materials and furnishings can be sources of unhealthy emissions and airborne particles. Cigarette smoke is a rampant indoor pollutant, with some studies showing secondhand smoke making as many as 15,000 people sick every year. Discourage anyone from smoking in your home. Another silent killer is carbon monoxide. Carbon monoxide is a deadly gas that could leak into your home from gas appliances, such as gas stoves and hot water heaters. Make sure to install a carbon monoxide detector to keep your family safe. The great outdoors is a source of sunshine, beauty and peace, but it can also be a source of unhealthy pollutants that can enter your household. Pesticides can come in through the air, food, plants or other carriers, and other airborne pollutants can enter your home through general air exchange. Radon is another sneaky hazard, potentially seeping into your home through the ground. It’s an odorless, colorless, and tasteless gas, leaving you completely unaware of its presence unless you test specifically for it. This Old House explains that you can easily test your home for radon with a simple DIY kit. However, should your home test positive for unhealthy radon levels, do not DIY the project of remedying your situation. Be sure to hire a certified specialist to mitigate radon, since doing the work improperly can actually raise the radon levels in your home or otherwise reduce the air quality. Balance the inside with the outside. You can take even more simple steps to ensure your home’s air is healthier to breathe. One suggestion is to open your windows when the weather is agreeable to allow in fresh air. 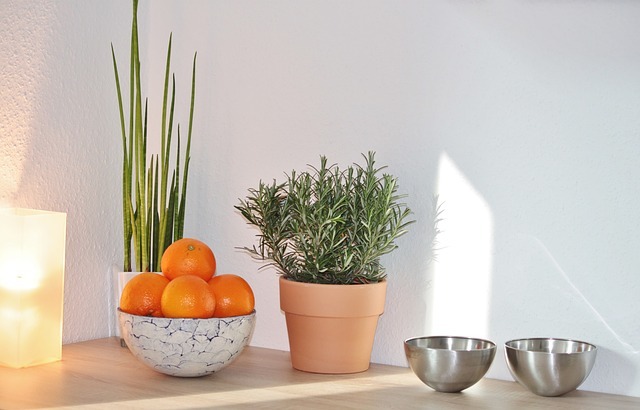 Another idea is to include plants in your home environment. Slices of lemon and orange peels can also help clean your air, and baking soda is a wonderful, natural air refresher. You can also avoid adding toxins to your home by choosing products made without harmful chemicals; some experts suggest looking carefully at your cleaning and washing products. Opt for vegetable oil-based soaps, which are fragrance-free. You should also do some basic maintenance to help your home stay free of pollutants, such as changing your furnace air filter regularly. When you do DIY projects, select paints and other materials with low and zero volatile organic compounds (VOCs). Those who are sensitive to VOCs often experience mild symptoms, such as itchy eyes, but some individuals can sustain damage to their central nervous system, kidneys or liver. You can reduce your exposure to VOCs in your home by using a high-quality air purifier. It’s important to have a proper perspective on the air quality in your home. Add a touch of nature to your décor as a gentle reminder to be alert to these potential threats, and to take the steps to reduce contaminants. You and your family can breathe easier with fresher, cleaner air. Photos by Michael Ruiter, Eea Ikeda, Kinga Cichewicz. Suzie Wilson is an interior designer with more than 20 years’ experience. What started as a hobby (and often, a favor to friends) turned into a passion for creating soothing spaces in homes of every size and style. While her goal always includes making homes look beautiful, her true focus is on fashioning them into serene, stress-free environments that inspire tranquility in all who enter. Suzie’s website, HappierHome.net and book, TheUltimate Guide to Prepping Your Home for an Open House are filled with tips, tricks and other advice to set you up for success.